King Solomon had strong words on liars and deceivers, and he makes that clear in Proverbs 10:3: “The mouth of the just shall bring forth wisdom: the tongue of the perverse shall perish.” But although the wise King’s advice is a key to a prosperous financial future in income property investing, the tongue of the perverse has been a part of mortgage lending since before the housing collapse of 2008. Now, new reports from the Federal Housing Finance Administration accuse megalenders Fannie Mae and Freddie Mac of manipulating profit numbers by failing to write off delinquent mortgages. The fate of Fannie Mae and Freddie Mac has been in question since the housing collapse of 2008, when both agencies fell into bankruptcy after the subprime mortgage bubble burst. They were bailed out by the government and placed into conservatorship under the oversight of the FHFA, but continued to underwrite loans – a lot of loans. Today, mortgages originated by these two companies accounted for over half of the home loans in the country, and their record profits have been hailed as a sign of a stronger housing recovery. But as part of the ongoing FHFA supervision, Fannie and Freddie are required to write off more of the delinquent mortgages that they own or back in order to conform with bank lending procedures, which call for writing off mortgages that are more than 180 days delinquent. Both agencies are putting off implementing this rule until 2015, and that move raises concerns about current profit numbers, and also about how they account for future losses, since those delinquencies are missing from financial reports. By stalling on writing off these delinquencies Fannie and Freddie are avoiding a bump in losses that would take a bite out of those record breaking profits they’ve been posting. And that also affects the amount they’re paying back to the government for the bailout money – which has already totaled $190 billion in dividends. Currently, Fannie Mae and Freddie Mac hold off on writing off delinquent single-family home mortgage loans beyond the 190-day cutoff, and only do so if there’s a foreclosure. That allows some homeowners to seek an alternative such as refinancing or a short sale to avoid a complete collapse – and a total loss in revenue from the loan. But all loans originated with either Fannie or Freddie must be backed by the government anyway, and that’s the real reason for their current high profits. Because that’s true, say FHFA representatives, it’s essential to impose stronger regulations on housing finance. Fannie Mae and Freddie Mac have a peculiar status as lenders. They’re semi-government agencies in conservator ship, still paying back billions in bailout money while continuing to underwrite trillions in loans. That means that their fate is always linked to plans for housing policy reform. Puzzanghera, Jim. “Fannie Mae, Freddie Mac Delaying Write-Offs of Delinquent Mortgages.” Los Angeles Times Business. LATimes.com. 19 Aug 2013. Join Jason Hartman and his team of investing experts in Austin, TX on September 28, 2013 for the one-day Executive Tour of Austin properties and on the spot investing support. For more information, click here. Is the End Near for Fannie Mae and Freddie Mac? Fannie Mae and Freddie Mac: an Uncertain Future? 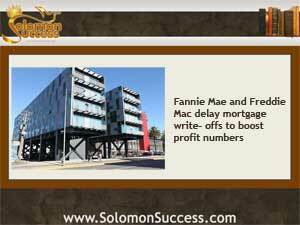 Fannie Mae and Freddie Mac: A New Look for Mortgage Lending?